OFF KLTR JOURNEY TO WALDORF: THE SEARCH FOR A SOLUTION (part 3 of a 4-part series) | OFF KLTR! As I mentioned in a previous post, I had thoroughly searched our town and the surrounding areas for a preschool (maybe even, God willing, a play school for Keira). And I just never found a good fit. So, I widened my search and investigated any and every type of school. The Council for American Private Education Website was a good starting point for my research. I was eating this all up! I couldn’t get enough of it!! There wasn’t enough for me to read. I started reading a lot about reincarnation. A great starting point, if you are interested, is Many Masters, Many Lives by Brian Weiss. The concept of reincarnation was so freeing. This life is just one of many. The world is like a playground for learning. In each life, we are supposed to learn something in particular. We suffer in some way, but from that suffering comes tremendous opportunity for learning and to growth. Okay, I’ll stop here!! But you will see that the work I was doing for my own personal development was highly aligned with Waldorf education. Waldorf educators believe in reincarnation and that children are born with unique gifts and purposes. They aim to support the whole child on his or her unique path. Waldorf Education was founded by Rudolf Steiner and I’ll tell ‘ya right up front, Waldorf schools worship this guy. Now don’t get me wrong, he was an incredibly smart man and I am 100% behind much of what he said about education and child development. But worshipping your founder does start to flirt with being a cult. But anyway…by focusing on the development of the whole child, he built a whole new way of educating children, based on the belief that children learn with their hearts and their hands, not just their minds. And Waldorf schools educate children’s minds, bodies, and souls. I am more than oversimplifying Waldorf education, so if you would like to learn more about Waldorf education, here are some really good starting points: Why Waldorf Works Website, Heaven on Earth, and Waldorf Education: A Family Guide. In doing all of this research, I came across a book called Simplicity Parenting. It is a parenting book written by a Waldorf dad who, as a very young man, fresh out of college, worked in Asia with children living in refugee camps. When working in England on an advanced degree to become a therapist, he counseled children in very wealthy families. And listen to what he found: these rich, over-scheduled children were suffering from the same PTSD symptoms as the refugee children he worked with in Asia many years back! The kids were stressed out by their incredibly busy lives! AND he found that when parents slowed down their family’s lives, the kids healed. They settled into themselves. They got quieter. Of course some kids are loud. And they just moved away from the crazy ADHD extreme to a more middle of the spectrum, loud kid. And the kids who totally went inside themselves, they moved away from that extreme and become more engaged, but still quiet kids. 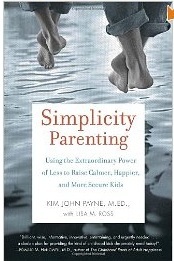 After reading the book, I convinced my beloved husband to take the Simplicity Parenting Class with me. We traveled all the way from Sharon to Lexington every other Saturday for this class. I really do have a good husband, don’t I? Another important piece of our story is that Keira was unraveling during her second year at the preschool. We didn’t know at the time, but she had soul fever (thank you Kim John Payne for coining the phrase!). She was dissolving almost every day. And her temper tantrums almost always ended in her lashing out physically – hitting and punching. This wasn’t my girl. So we signed up for a Simplicity Parenting class. It quickly became apparent that our girl had too much going on. She was going to school five morning a week. What was I doing? I was home full-time. Why was my 4 year-old in school five mornings a week? Well, in point of fact, I was following the school’s suggested schedule for kindergarten readiness. But really, she was a little girl. A little girl who was so overstimulated by her school, that it was all she could do to keep it together at school and then she fell apart at home. So after a couple of parenting classes, we dropped Keira down to 3 days a week of preschool. What a difference it made at home! She relaxed. She stopped hitting. But interestingly, at school, the teachers saw adverse effects of the decreased days: she withdrew a bit at school. Of course, the school felt that we had made a poor decision as she wasn’t going to be as ready for kindergarten, but Rob and I knew that a peaceful, calm family life was more important than a kindergarten-ready little girl. So as we began to make other changes to simplify our family life as a result of what we learned in the parenting class, we saw big changes in our girl. And in ourselves. The Simplicity Parenting class is highly aligned, but not officially connected to Waldorf Education (as I mentioned previously, Kim John Payne is a Waldorf dad). So we couldn’t help but more seriously consider this type of education. Tune in again tomorrow for part 4, the final installment of the series. Give me an A – N – D – R – E – A! What does it spell? The original Simplicity Parenting Mama!! I remember so well that half vs. full-day sales night (oops! I mean K open house!!). Full Day K is a money maker for the town. Your girls will do famously in half-day K this year and then when they are almost 7, they will be so much more developmentally ready for the full-day in first grade. It was so great to see you guys today!! Natalie asked if she could come with us every time we go to your house. Too sweet!! Wonderful to hear what a difference the book made in your life. I think it’s the best parenting book out there!